I developed this recipe when I realized I was careening toward holiday burnout. I already completed Thanksgiving, Christmas, Hanukah and New Year’s Eve weeks ago with articles and recipes for this season of feasting (and regret.) I also completed a cookbook, coming to you in the spring of 2019. The book is an all-blueberry book, filled with scrumptious blueberries treats. But by the end, I was having a sugar meltdown. I had to do something, and here it is: a healthy meal that you can squeeze in between the parties and the self-remorse of holiday over-indulgence. Hey! Give yourself a break and don’t be hatin’. Just be sure to take a mini break from all the rich food once in a while. I made a huge batch of this cauliflower “Bolognese” sauce. I’m feeling relief and yes, a little smug, because I know that when I’m tired, hungry, desperate and cranky, this is in my freezer. I can cook some pasta, put my feet up and take a break. This is for you, mothers, sisters, grandmothers, i.e., women (sorry guys), who are probably doing a lot of heavy lifting this holiday. Make it now, heat it up later!! It didn’t take long for cauliflower rice to become so mainstream that you can now find bags of it in the freezer section in most supermarkets. But step away from the rice! 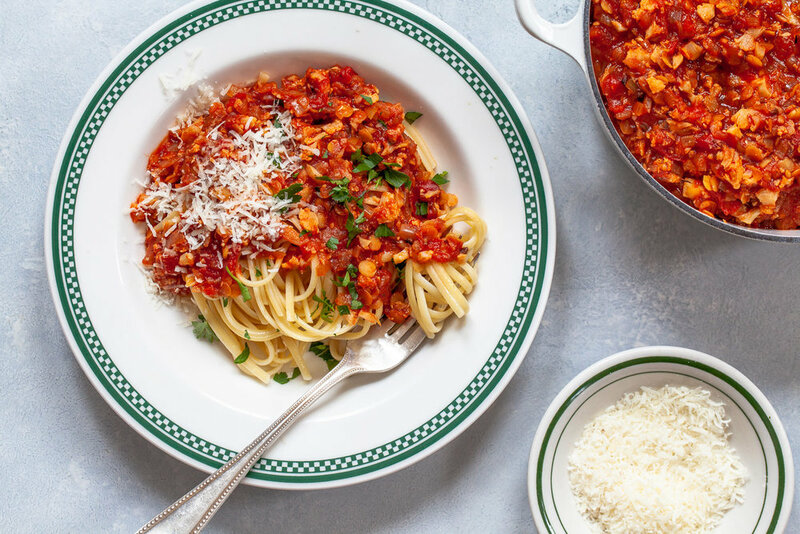 With tiny chunks of cauliflower, lentils and a deep red tomato sauce, this sauce looks a little like Bolognese, but without the meat, and it makes a satisfying vegetarian meal. I contemplated how to make a vegetarian sauce as tasty as meaty Bolognese and employed a few tricks on the way. Chop the cauliflower in the food processor, but leave it in small chunks (it’s not like cauliflower rice) to give it texture. Roast it in the oven until it is golden, and while that is going on, caramelize the onions on top of the stove. Both techniques transform the vegetables to give them deep flavors. Using another toasting technique, burnish some tomato paste over the heat in the pan with a little sugar to intensify its flavor. White wine, cooked down with the onions and tomato paste, adds another layer and lentils give the sauce extra body and heft, not to mention protein. At this time of year, with so many rich dishes on the groaning board, it’s nice to offer something lighter but still satisfying. 1. Set the oven at 425 degrees. Line a rimmed baking sheet with parchment paper. 2. In a food processor, one-half at a time, pulse the cauliflower to coarsely chop it. It should be in small pieces with a few small chunks. 3. Transfer the cauliflower to the baking sheet and toss with 2 tablespoons of the oil, salt and pepper. Spread it out in one layer. Roast in the oven for 25 to 30 minutes, or until golden and caramelized at the edges of the pan. 4. Meanwhile, in a large flameproof casserole over medium heat, heat the oil. Add the onions, and cook, stirring often, for 15 minutes, or until deep golden brown. If the onions start to stick to the bottom of the pan add water, 1 tablespoon at a time, to release them from the bottom. Stir in the garlic, and cook for 1 minute. Push the onions and garlic to one side of the pan and move the pan so that they are off the heat, leaving a clearing over the heat. 5. To the empty side of the pan, add the tomato paste and sugar. Cook, stirring, for 3 to 4 minutes, or until it is dark red. Stir the tomato paste into the onions. Add the wine and simmer for 5 to 6 minutes, or until it is mostly evaporated. Stir in the tomatoes, stock or water, lentils and salt and pepper to taste. Cook, stirring often, for 25 to 30 minutes, or until the lentils are tender. Stir in the cauliflower and reheat the sauce if necessary. 1. Bring a large pot of salted water to a boil. Add the linguine and cook, stirring occasionally, for 8 to 10 minutes, or until the pasta is tender but still has some bite. Drain in a colander. 2. Divide the pasta among 4 pasta bowls or deep plates. Spoon the sauce on top. Garnish with fresh parsley and sprinkle with Parmesan.